Separate gi pants for when your current pair wear out. These can also be useful for indviduals who fall between sizes and need a separate gi top and bottom. These particular BJJ pants utilize single weave weight and construction, providing great mobility and comfort. Fuji also carefully provides reinforced stitching and seams where they count the most. 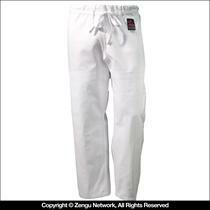 Email your friend about the White Single Weave BJJ Pants. Ask a question about the White Single Weave BJJ Pants.